This is basically what I'm seeing in the ancient DNA published to date. 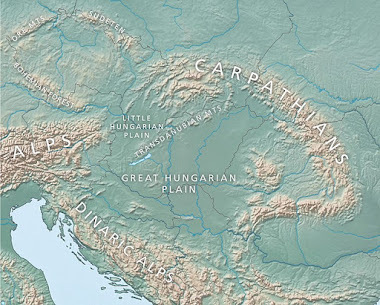 Thus, the Kurgan hypothesis or steppe theory, which, of course, posits that the Proto-Indo-European homeland was on the Pontic-Caspian steppe, is looking really good at this stage. Indeed, unless there are some ancient DNA shocks on the way from, say, Anatolia or the Caucasus, that might buck the trend, then this one's in the bag. What about Cucuteni Tripolye ? G2a ? Are they not the best example available of Proto-Urban Dwellers ? There are lots of proto-urban sites, but most are located within that zone that I circled. And there may have been J in CT. Impossible to say either way considering the sampling. As far as I know G2a were found in Ancient Samples of Iran, Anatolia, Balkans,Italy and Spain. Could that not be a clue ? Populations that were J-rich need not have lacked G2a. But it's mostly J that is expanding within that circled zone during the Chalcolithic and Bronze Age. Maybe J adopted the building techniques and refined them and became more Urban than G2a.? Btw, just in case anyone wants to get really technical, I'm using the term proto-urban very generally here, to refer to both actual proto-urban sites and early urban sites. The J stuff is interesting. Will say, like all uniparental lineages, it seems really hard to get the large sample sizes in ancients (at least so far!) to say everything that we want to know about. Y chromosome seems like an area where we could get a lot more out of really massive sampling of modern day populations and whole genome sequencing of the Y. Find out if the y's subset of J lineages really did undergo a major population size increase in the Chalcolithic time period, or not. We don't see any sign of this so far in Kivisild's tree (https://www.ncbi.nlm.nih.gov/pubmed/28260210) for instance, but thate tree one may be too coarse and limited by extent and region of their sampling, only able to pick up initial expansions after Neolithisation and not sensitive to later expansions. The map is nice other than it goes way to far west unnecessarily. Britain didn't have R1 at all not even dead lines. Why does the map go to far west? Maybe my timings wrong but if its after the time Britain had R1 than its to small so its either to large or to small. Britain started having R1b around 2500 bc before that it had none. This is a fact. Y-dna J2/J1 seem to start of in the southern part of Central Asia, as the first explorers and populators of Trans-Caucasia and Northern India, some 11.500 years ago. From this core-area they seem to have expanded, like by an outlier, to the west - duirng MBA - reaching Mesopotamia at the time of Sargon, around 4.200 years BP. Shotly thereafter the Akkadian wheels rolled into the Anatolian valleys and the Levantian steppes, reaching Cyprus and Crete during the time of the great conqueror Naram-Sin. The Cretean-Minoan dynasty that was substituted during the Akkadian invasion was of y-dna G2a2 - as expected. The gross majority of all aDNA known from Mesopotamia, Anatolia and Asia Minor, together with the rest of the Med, are G2a2/G2a1. Untill the massive intrusions and etnic campaigns of the Akkadian and Achamenid wars, between 4.200 and 2.400 BP. A PIE homeland in the ponto-caspian steppe always seemed more likely than any alternative hypothesis. So far Ancient DNA has confirmed theories that suggested links between the cultures of the pontic steppe and those to its west such as corded ware and those to its east such afanasievo. At this point only something as improbable as an r1a dominated yamnaya twin in neolithic south asia could create serious challenges for the steppe hypothesis. What remains to be worked out is where exactly on the steppe PIE is likely to have been spoken, the path of immigration of Indo-Iranians into South and West asia and the origin of the anatolian languages. thanks for your work, Davidsky! It's specifically J2 we're talking about in terms of an expansion, no? J1 seems more southern. The proto/early urban J-rich people came from groups with large effective population sizes, because they were the descendants of farmers from the Fertile Crescent. So they were very similar, but also with a lot of diversity, and I think this is why J1 and J2 don't show the star like phylogenies that R-M269 and R-M417 do. Ireland_EBA shares a lot of IBD with Yamnaya and Afanasievo, and belongs to R1b, and R1b is an R1 lineage. Yes it's interesting this proto-Urban zone (a misnomer) with actually stretches from Hungary (with Vucedol forts) to Greece Anatolia BMAc and Harappa, all c 3000-2000 BC. It must be coincidental that this is where the earliest IE is also attested in that stretch of zone. I changed it to proto/early urban, so it's no longer a misnomer. And yes, it is a coincidence, because writing was first developed in the proto/early J-rich zone, so this is where all sorts of languages were first attested. There was no way for them to be attested in the northern R1-rich zone. i wouldn't paint the picture that everything south of the steppe as one homogeneous Zone of "civilised basal people". this misses the huge differences between Mesopotamia, west Anatolia , East Anatolia, the Caucasus, SW Iran , north Iran, and even Egypt that's brought up. I never said the J-rich zone was exactly a homogeneous one. See my reply to Matt. But certainly the R1-rich zone was homogeneous, and therefore a much more plausible vector for the spread of Indo-European languages from the Atlantic to South Asia. Yes, thank you! Your blog has been very helpful in researching the origins of my MtDNA lineage. Especially since my ancient Grandmothers migrated from the PC Steppe to Germany with the CWC. Linguists generally don't agree with a single, big-bang explosion as an explanation for PIE. I would leave open the possibility of more protracted and complex diffusion. It was something close to a big bang, but only relatively speaking, because that R1-rich zone existed for thousands of years, and the arrows coming out of it don't represent expansions happening at exactly the same time. I'm very happy with what ancient and modern DNA from the Balkans shows in this context, and a lot more ancient data from the Balkans is on the way. It's down to the nitty gritty because it was always pretty clear that the BaltoSlavic to Celtic branches came from the same expansion.Anatolian could not have come from Yamnaya right?If the steppe is the PIE homeland it must have come from an earlier steppe group. Before any ancient Middle East genomes were sequenced I did say that EEF mtDNA in the Middle East was replaced by proto-Civilization people from Iran like the Ubaid. It was based on a museum I went to which made it pretty obvious there was a big migration from Iran into the Near East. But now I don't think EEF mtDNA existed far east of Turkey. EEF mtDNA, the main component in modern European mtDNA, was single subset of ancient Middle Eastern mtDNA diversity which never made a big impact anywhere outside of their homeland other than Europe. 2) Mycenia and Greece got a large influxes of CHG POST 4000 BC which were larger than any potential steppe component they got around the same time. Obviously, the fact that there was CHG-related ancestry in Mycenae is linked to the J-rich zone extending to the Aegean. And the CHG-related ancestry on the steppe doesn't change the fact that there were expansions from the steppe, does it? No one really knows yet how the CHG-related ancestry made it onto the steppe, but it's unlikely to have come from the South Caspian or even the South Caucasus, because the uniparental markers don't match, and clearly it didn't arrive with Y-hg J males, did it? What do you think triggered this migration ? Proto-Indo-Iranian migration into Iran or Climate change or a combination of the two ? As far as I know Sumerians and Akkadians are the oldest known people of Mesoptamia. Neither were Indo Iranian. Iranians migrated through the Caucasus into Mesoptamia and Iran. When did G2 enter the Caucasus ? Did they live alongside J2 in the Caucasus since the Mesolithic ? Could G2 also have become mostly CHG carriers ? If your model of two civilizations correlating with hg. J (black) and R1 (red) is true then this will put into question many linguistic and religious reconstructions. Linguistic or religious elements reconstructed as common for example to Italy, Greece, Anatolia, Iran and India but absent among Slavs may belong to the heritage of J-civilization and not R1- civilization and thus may not be Indo-European. Under the circumstances we cannot be sure what kind of religion Dumezil reconstructed, i.e. what in his reconstruction comes from R1-civilization and is IE, and what from J-civilization and is not-IE. While there the bronze age was characterised by movements of people from the steppe, largely carrying R1 lineages into territories occupied by farmer groups, many of who carried lineage J it isn't meaningful to identify them as 'two civillizations or cultural entities'. Most of the farmer groups were highly divergent, having separated several millenia before prior to the neolithic. The creation of a 'proto-indo-european' cultural group likewise involved influences from the farming groups of the caucasus and those in eastern europe. Also the proto-indo-europeans likely already had some degree of cultural and linguistic variations within their geographical range. Indo-Iranians for example share some cultural/linguistic commonalities with the greeks who likely occupied the SE part of the homeland and some with the Slavs who occupied the North. Some commonalities were created through later interactions. Some Indic features shared by greek might actually have involved a complex chain of transmission via hurrians and anatolian speakers. What I am saying is that we cannot be sure about it anymore. I am using the term ‘civilization’ in a very general and speculative sense, meaning something common based on religion and culture like we can speak about influences of Christian civilization or Islamic civilization. Because Mycenaeans look like indoeuropeized Minoans and Minoans look like Anatolians, surely their language, religion and culture is a mix of influences of ‘J-civilization’ and ‘R1-civilization’. I suspect that the same will be discovered in India where Vedic Aryans will look like indoeropeized locals who had strong links with ‘J-civilisation’ (If Davidski’s model is true). Under such circumstances everything is possible and generally accepted linguistic and religious reconstructions may not be entirely true, i.e. complexity of interactions and influences may be much greater than it has been assumed. The evolution of mythology/religion/ethnic identity etc. is far too complex to be explained on the basis of population genetics. While language is usually transmitted to a toddler through his parents, the same can hardly be said about religion. While the slavic males may predominantly be r1a, they owe close to half their ancestry to Neolithic Farmers too. There's nothing to prevent their mythology having been influenced by such groups too. While 'christian civillization' or 'islamic civillisation' are the products of literate societies that were born around a millennium and a half a go, any hypothesized 'J civillisation' would mean implying some sort of cultural continuity over 1000s of miles in a pre-literate era oweing to common ancestry over 10,000 years before. "Obviously, the fact that there was CHG-related ancestry in Mycenae is linked to the J-rich zone extending to the Aegean. And the CHG-related ancestry on the steppe doesn't change the fact that there were expansions from the steppe, does it?" First demonstrate the correlation of R1 with Mycenaean and Anatolian. It should be demographically significant .... at least 20 %, otherwise your model of R1 = IE exclusivity fails. "I suspect that the same will be discovered in India where Vedic Aryans will look like indoeropeized locals who had strong links with ‘J-civilisation’." That is very unlikely. Here is why. We can clearly see a cline in South Asians : steppe-rich Kalash, Brahmin, GujaratiA form a cline on one side. While Iran_Neolithic rich- groups Baloch and Brahui form a distinct cline, very West-Asian shifted. Above chart is Razib Khans analysis. Vedic people more of less, will be similar to steppe-rich Indo-Aryan groups. While Iran_Neolithic-rich could be pop' who introduced wheat farming to South Asia. When it comes to Y-DNA J in South Asia, (most of it is Y-DNA J2*). It is more common in Dravidian speakers than in Indo-European speakers. That itself says a lot. Simply based on farming pattern, I believe IVC will turn out to be Iran_Neo + ASI. Iran_Neo-rich groups introducing wheat farming and ASI-rich groups introducing rice farming = forming Proto-IVC people. "Indus populations were the earliest people to use complex multi-cropping strategies across both seasons, growing foods during summer crops : rice, millet, urad and horsegram and winter crops : wheat, barley and pulses, which required different watering regimes. The findings suggest a network of regional farmers supplied assorted produce to the markets of the civilisation's ancient cities. We found evidence for an entirely separate domestication process in ancient South Asia, likely based around the wild species Oryza nivara. This led to the local development of a mix of 'wetland' and 'dryland' agriculture of local Oryza sativa indica rice agriculture before the truly 'wetland' Chinese rice, Oryza sativa japonica, arrived around 2000 BC,"
However, the area inhabited by the Indus is at a meteorological crossroads, and we found evidence of year-long farming that predates its appearance in the other ancient river valley civilisations." Below is Razib Khan's analysis of Iran_Neolithic ratio in South Asians. Apart from Makrani and Baloch, We can see Dravidian groups like Mala, Vishwabrahmin, Brauhai make it to the top with higher ratio of Iran_Neo ancestry. But, steppe-rich Indo-Aryans Kalash, Brahmin, GujratiA have less Iran_Neo and are at the bottom. As to the cultural and linguistic aspects of this flow, here it gets more complicated. Spoken language and simple emotive content are generally passed down by the mother, and some important migrations on this map were probably male-mediated. But here the propagation of cultural content endlessly muddles up the issue: a child reared in his mother's tongue may well aspire to the (distant?) father's culture, and memorise all the sacred stories to end up bi-lingual. Cf India versus Portugal. It gets more intricate even for Sprachenbund situations, where they might end up tri-lingual. Following linguistic trails is like undoing Gordian knots. Alexander brutally hacked into his Gordian knot, and I hesitate to admire him for this. But the education Davidsky brings to his 'simplicty' is of a very different order. Looks good! Bravo! Let's go to the very middle of this simplistic map: Caucasus! Maykop! Not really candidates for PIE, are they? But very close! PS. What about the convoluted history of R1b? Having studied Southern Levantine archaeology and Mycenaean/Minoan philology--Linear A and Linear B--generalizations about a pan-Near Eastern/Aegean culture are not well-received these days academically. That said, I've noticed several cultural insignia across the regions from the Aegean to South Asia that Davidski terms the J-Urban culture. These would include massebot/standing stones/herms, female (in Bronze Age) goddess figurines, a male consort of the goddess, calendric rituals associated with harvest and winter wheat, etc...One could also add, somewhat controversially, the Mediterranean culture of shame and the worship of the Virgin Mary and the bhakti movement in India as modern refractions of an ancient Near Eastern culture. You just pulled that 20% out of your behind. All that needs to be shown for my map to be accurate is that there was a population movement from the R1-rich (not R1-exclusive) zone to the Balkans, and, of course, this has already been shown. The map shows a zone of J-rich proto/early Urban, often highly differentiated, ancient cultures, not any one civilization as you claim. You mean female seclusion and veiling? Concepts of honor and Purdah? That would be an interesting hypothesis indeed. Let's not forget the Flush Toilets... Heheheeeh. @Davidski: So they were very similar, but also with a lot of diversity, and I think this is why J1 and J2 don't show the star like phylogenies that R-M269 and R-M417 do. Agreed. We should still see some increase in population size within J haplogroups if populations with higher frequencies of them expanded relatively in the Chalcolithic (and not earlier) though. Other scenario - J populations were growing slowly since Neolithic at similar rates as others, but were more common in the vast areas of the ME which we haven't let sampled. Then Chalcolithic just sees break down of barriers -> relatively enrichment of J in areas we have sampled. Will take lots of sampling of moderns in Middle East, but may be easier than trying to estimate from ancients. @ Singh the Kalash have the most Iran_N ancestry , after Baloch/Brahui , and they have the most Steppe Ancestry in region. I would infer the same for other upper castes living in the Northern Indus-Gangetic delta (Jats, Arains, Khatris, Brahmins) , and based of the models I have seen others do, they do come out with mainly Iran_N. Razib is right on his hunch on Steppe ancestry being overestimated . As well as his other assessments . As for Vedic Indo Aryans, I doubt they would be like those on Proto Indo Aryans/ Indo Aryans in Central Asia, my guess is they would be like more Steppe shifted versions of Kalash , or even Kalash like, . Vedic reflects a fusion with the locals in the way same way the Yaz culture was formed with Oxus people and Sintashta people.So EastPole is right in that regard. When I read your blogs and comments by other readers, I feel like a complete idiot. I am new to Gedmatch. Can anyone tell me how to interpret the results found in the Oracles? Are all the tests in Eurogenes focused on "deep ancestry?" I am completely embarrassed that I am asking these questions publicly, but I cannot make sense of Gedmatch, no matter how many blogs I read. If you cannot help me, I completely understand. Thank you.